Scotland. The name conjures images of green rolling landscapes, rugged windswept coastlines and equally rugged folk. Eidetic memories flow from my genetically encoded resources out of time. And now the time had come when I was to make the memories stand to the experience. I was headed to Scotland. My daughter Fiona, 13 years old, and I set out from Phoenix to Chicago to Glasgow on July 5, 2006. We met up with many of our fellow travelers in Glasgow Int’l Airport on the early morn of July 6. I had been offered the job of expediting a tour being put together by my friend of many years, Daniel Giamario. He, being the founder of Shamanic Astrology, a system of astrology that incorporates the mythic perspective of archetypes as the perspective of viewing a person’s chart, had asked me to handle the logistics of arranging hotels, restaurant reservations, site visitations, transportation and general logistical support for a group of about 20 participants who were to spend a full two weeks traveling through the Scottish countryside. I jumped at the chance, as it afforded Fiona and I the opportunity of going along on this unique trip. My job description also included ‘wrangling’, that is, handling the day-to-day affairs of our group, interactions with the various staff and officials, as well as any interpersonal dynamics that might arise amongst group members… always a given in any group of this size and length of stay. From Glasgow we flew into Stornoway, Scotland, a city on the Isle of Lewis in the Outer Hebrides. If that sounds remote, well, you’ve got that right! Located at 59 degrees north latitude, Stornoway is situated on the Atlantic coast, on the northwestern shore of the isle of Lewis. Steornabhagh is the town’s name in Gaelic, the original language of Scotland, and one that is still spoken in private conversations in the Outer Hebrides. The folk of Lewis are staunchly religious, being of the Scottish Free Church, a church that had its origins in 1843 as an expression of the need to free themselves from the dictates of the British state’s interference with their religion. This fierce independence still remains as a mainstay of the culture of the Hebrides, even of all Scotland. One thing the Scots all hold in common is their disdain for everything British. The people themselves, despite the rather fundamentalist aspects of their religion, are friendly and warm to strangers, while at the same time being rather protective and circumspect about their own affairs. Probably a good thing, in that their culture still remains intact as a consequence. I’d even go so far as to say that the people of the Outer Hebrides are pretty wild in nature. They laugh heartily, drink freely, speak their minds easily and are polite when treated kindly, coarse and rude when mistreated. I liked them a lot! 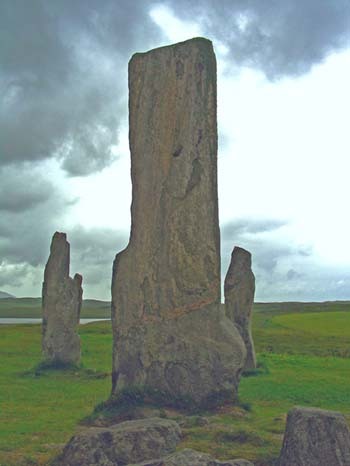 The primary reason for our Shamanic Astrology group being on Lewis was to visit the Standing Stones of Callanish that are to be found about ten miles from Stornoway. Neolithic peoples, over five thousand years ago, placed large slabs of granite rock into placements that allowed for the precise prediction and observation of a unique lunar phenomenon that is referred to as ‘When the Moon Walks Upon the Land’. Due to the slightly irregular angular relationship of the Moon’s orbit to the Earth’s ecliptic (think of a line extending out from the Equator), the Moon rises way far to the north and then the south of its norm every 18.6 years. This continues, visibly, for about a year and a half, twice a month. The most extreme of these events, known as lunar standstills, happen at the Full Moons closest to the Winter and Summer Solstices. The event window for 2006, that we were on hand to witness, was the night of July 9 & 10. Because of the typically low journey of the Moon through the sky at such a high northern latitude in mid-summer being accentuated with a Moon rising far to the north of norm, and having to traverse the entire sky to a northwesterly position of setting, the Moon passes very low against the horizon’s backdrop. That it, the Moon has the appearance of walking on the land, just skimming the southern skyline. In addition, the place our Neolithic ancestors chose to erect this monumental ceremonial observational construct has, as its visual backdrop, a low range of mountains in the south. These ranges of hills have the shape of a woman laying on her back, toes to the north, head to the south. An up thrusting rock formation situated in front of this natural formation provides the Woman of the Hills with the silhouetted visage of a pregnant belly. 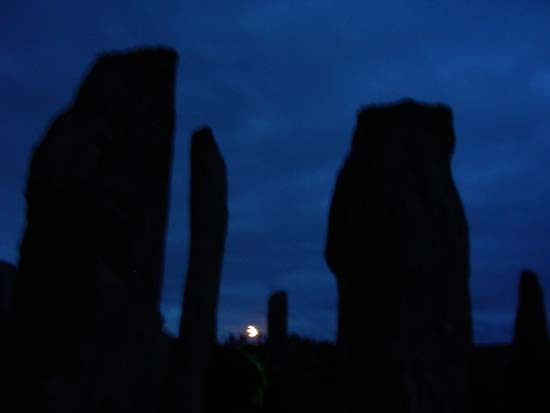 From the vantage point of the Callanish Standing Stone Circle the Moon, as it rises, seems to roll along the body of the Woman of the Hills, moving along her length, then setting into her pregnant belly! From another viewpoint, the rock formation becomes a pillow beneath her head, and the Moon, from there, looks to set into her crown. All the while the various stations of the Moon’s progression can be viewed from behind the different standing stones, sighting along the edges and tips of the other rocks in aligned formation. We were well informed and instructed in these alignments and their significance by Margaret Curtis and her current husband Ron Curtis. 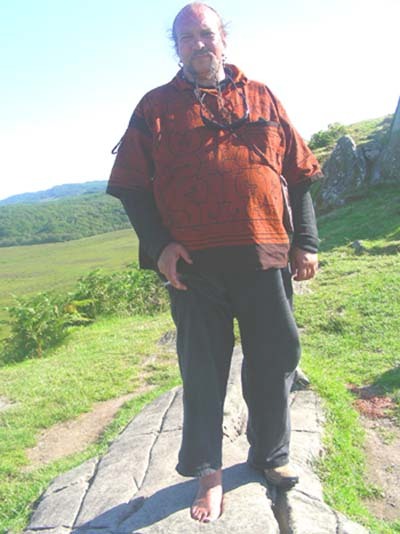 The vast resource of information they, and Margaret’s former husband, Gerald Ponting, have amassed regarding the history and structure of Callanish is amazingly rich and detailed, confirming the Earth and Sky Wisdom teachings of Shamanic lore, even though they began as skeptics. 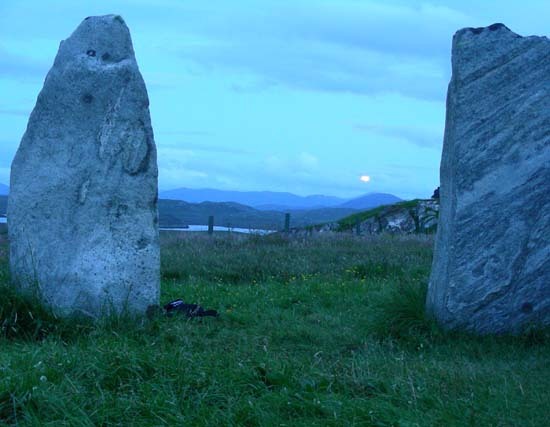 Any contemporary knowledge on Callanish is directly attributable to their research and compilations of historical investigations and knowledge. 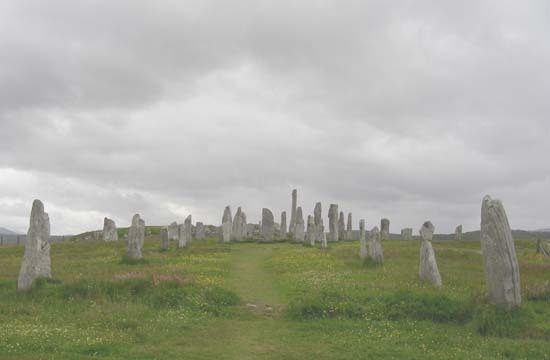 Here is an excerpt from ‘Going Round in Circles’ by Gerald Ponting: BRIEF DESCRIPTION OF CALLANISH:Other stone circles have central stones or burial chambers within them, outlying stones just outside the circle or rows or avenues of stones leading away from them. The Standing Stones of Callanish, Tursachan Calanais in Gaelic, are unique in possessing all of these features; the stone rows are the most prominent part of the site. 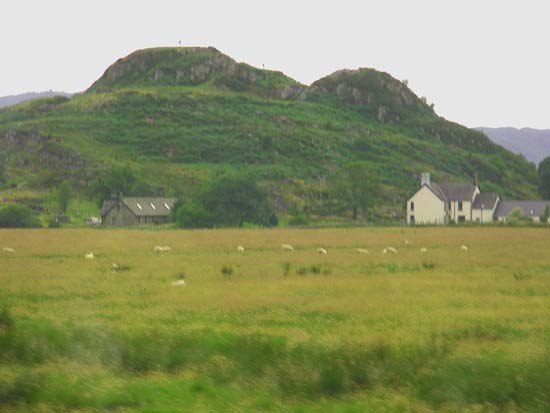 The stones stand on a ridge above the waters of East Loch Roag, clearly visible from both east and west. The overall layout is shaped like a distorted Celtic cross, with five rows of stones radiating from the central circle. From north to south, the overall length is a little over 400 feet, from east to west it is about 150 feet. At the center is a small circle of thirteen stones, from eight to twelve feet high. The axes of the flattened circle are only 44 feet by 39 feet. 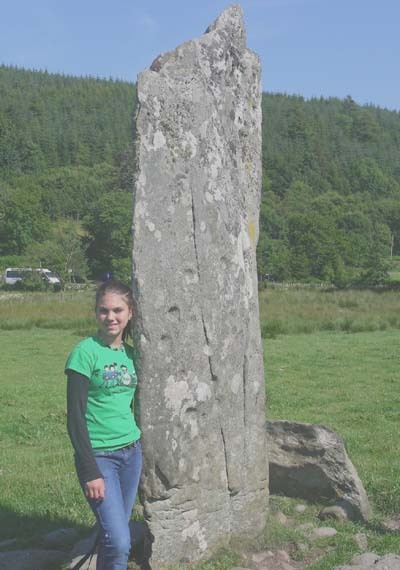 The tallest stone of all, at 15’ 9”, stands near the centre of the circle.The base of this central stone, and the bases of the two east-most circle stones, form part of the kerb of a tiny chambered cairn, 21 feet across. Just outside the circle stand two stones, a tall one to the southwest and a short one, with evidence that it was once broken in half, to the southeast. Two rows of stones form an avenue, which runs along the ridge, angled a few degrees east of north. It is 273 feet long and contains altogether 19 stones,Five stones run due south from the circle towards a rocky outcrop, making a row 90 feet long. This is the row which initially inspired Professor Thom to commence his studies.The 76-foot long eastern row contains five stones, the western arm is shorter at about 42 feet, with four stones; neither row is accurately aligned on the compass bearing. On the night of the lunar standstill there were approximately 200 people gathered at the site. Most were neo-pagan practitioners, some archaeo-astronomers, some were merely curious. There were those who had come with camera equipment ready to photo and video the grand event. And then there was the Scottish Free Church choir. They were belting out songs sung in Gaelic, hymns sung in English. The word went through the crowd that they were here to disrupt the spiritual observations that most had come for. So, when one of the elder choir members, the pastor as it turned out, approached me (I had been drumming constantly for an hour) and asked if I enjoyed Gaelic hymns, I replied that while I enjoyed the sound, being unfamiliar with the language, I did not know of what they sang. He replied that they were in celebration of God’s love and compassion and mystery. I asked him then why this night, this place, had they come to sing. He informed me that the lunar event being witnessed here was a sign of God’s greater plan, and that they came as a testament to that greater mystery. And where have you come from and why here tonight, he fairly asked of me in return. I told him of my travels with my daughter to come all this way to witness the unfolding of Creator’s Mystery, and to bear witness to this portent, as had our people done for thousands of years. He smiled and acknowledged that we were then here, each, for the same reason. ”Ah!” he finished, “So you are Gaelic! Let’s join our music together in praise of our coming together, our common purpose in being here tonight and of your family coming home.” I love these Scottish people. July 11 brought with it our taking our leave of Stornoway and the Isle of Lewis. We boarded our bus and drove one final time past the Standing Stones of Callanish, a sadness in our hearts to be leaving this magical site and the wild folk of the Outer Hebrides. The highways were narrow and macadamized (a Scottish invention, you know), twisting and turning through the rolling hills, green, green, green. At long last we drive into Tarbert, there to catch the ferry to the Isle of Skye. The ferry ride is long and unmemorable but for the scenery sluicing by as we chug across the sea. The Isle of Skye more than makes up for the boredom of the long ferry ride, however. It is an island that spills beauty out of every nook and cranny. Towering rock formations, strangely sculpted hills, rugged Scottish coastlines and the ubiquitous and picturesque whitewashed long house, with a chimney protruding form the roof at each end, adorn our view. We stayed in the town of Portree, a seaside town that has a wonderful music scene in addition to a rich cultural heritage of rebellion against the overbearing Brits. 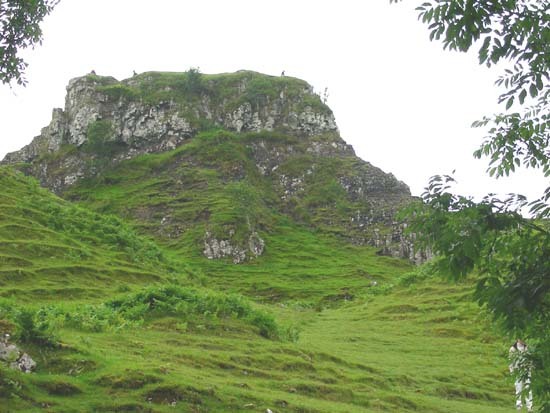 It was here, on the Isle of Skye, that Flora MacDonald hid Bonnie Prince Charlie as he attempted to regain control of the British throne from the Stuart usurpers. (Remember the song lyrics My Bonnie lies over the ocean, my Bonnie lies over the sea! Oh, bring back, bring back, bring back my Bonnie to me! This was not a song about some woman named Bonnie, but rather about Bonnie Prince Charles!) And it was the Skye Islanders that upset the tyrannical system of the landords’ crushing and feudal grip upon the Crofters (a societal system of communal farming in alignment with a Clan Chief), leading, eventually, to the re-establishment of the Hebrideans cultural legacy of crafting and the run-rig, whereby farmers changed possession of fertile and less fertile lands in rotation, so that none would forever be left with poor soil, nor possessed of riches beyond their kinsman. A day was spent on Skye to simply tour and enjoy. Part of our group went to climb the impressive rock formation known as the Old Man of Stor. Fiona went with this group, I led another group across the island to visit the Faerie Glen, a place the locals honor as being a home of the wee-folk. And it was indeed a wondrous landscape, this Faerie Glen. The hills, 365 of them by some’s count, each sculpted with lines and spiraling rings that encircle the grassy hills. Some have caves within them, where young sheepherders, taking cover form the rains, encountered the Faerie Folk, with resultant tales of magic and mystery. Those of us who visited this site swooned in its beauty and felt presence, and regaled the others with stories of sightings of the Little People. As we continued back down the highway to Portree, having circled the island by road, we stopped for a break at the Skye Museum of Islander’s Life. 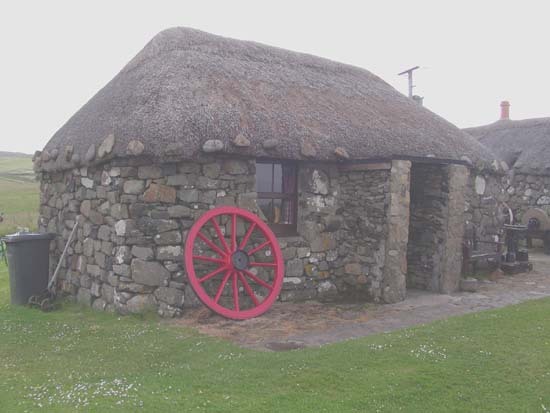 Original crofter’s houses, built of stone and thatch, heated by the burning of peat (as are the houses still), implements of war and farm, all are held in this museum. Another day’s journey took us to Dunvegan Castle, the former and current home of the Clan MacLeod. There on display is the famous Fairy Flag of the MacLeod Clan. The story is told of how Malcolm MacLeod had married a woman of Faerie. After the birth of their daughter the Faerie woman became homesick, and so Malcolm escorted her home to Anwnn, retuning only with their daughter. The Faerie mother returned briefly, however, and wove a blanket of green silk, adorned with many colorful spots. The blanket was then to be waved, as a flag, if ever the Clan MacLeod was in dire distress. Only twice has the flag been waved, with miraculous results each time, once in causing a sudden retreat of the attacking MacDonald Clan, another by returning immediate health to the cattle and crops that had suddenly become ill and weakened. Portree provided, as I had mentioned, a wonderful variety of music. Evenings I spent carousing the pubs, there to find local musicians playing Celtic instruments and music, Scottish folk and strange Norwegian dances. And yes, Fiona, drinking Laphroaig single-malt whiskey. Dark and peaty, it is a rare treat to find one of the world’s most prized single-malts poured libatiously (Now if I had really gotten as drunk as you like to tease me, Fiona, would I even be able to say ‘libatiously’? Huh? Huh???) to any who request it. These events are known as a Ceilidh (pronounced kay-lee), a traditional Scottish music and dance gathering. From Portree we headed across the island, driving over the Skye Bridge onto the mainland of Scotland. My how things changed! Immediately we were no longer in the quaint and comfortable realm of the Islanders. Freeways and gas stations, hustle and bustle abounded. Thankfully this was not to last, once we got off the primary highways and penetrated the deeper countryside of Scotland. Past Loch Lomond ( …by the bonnie, bonnie banks of Loch Lomond! ), through rolling sheep-covered hills, and astounding views of rugged coastlines, we made our way throughout the day, finally arriving at our destination, the valley of Kilmartin. Our lodging was in two separate places, as the smaller B&Bs that were our preferred lodgings could not accommodate all 23 of us. Ford House was where most of us stayed, a house out in the country, situated on a lane in the midst of farms and pastures, hills and lochs. Some stayed in town at the Rosebank, a B&B run by a quirky and warmly embracing Scottish married couple. It was just across the street from the Kilmartin House Trust and Museum. Kilmartin Glen is a valley that sits in the southern part of Scotland, just 100 miles north of Edinburgh and Glasgow. A long valley, though not all that broad, it is surrounded by high green hills and has insertions of fingers of sea known as lochs. Picturesque is too quaint a word to use to describe Kilmartin Glen. Its beauty has a depth that transcends imagery. There is a feel about the place, a feeling of comfort, of ease, of home. Indeed it was here that Fiona told me she felt this area was more ‘home’ than Arizona. We engaged the services of a local Bard as a guide and historical antiquarian. Scot is a mid-thirties fellow with long red hair tied back in a ponytail. His kilt was worn with the greatest of ease and utter lack of self-consciousness, worn as garb, not as regalia for show. He took us to a variety of spectacular sites in the valley, the first of which was a cairn. A cairn is, nowadays, considered to be a burial mound, and indeed some were used for such, but only in the centuries that followed their original construction. As we climbed down inside the cairn Scot sang a bit, and his voice resounded in the chamber with a fullness and richness that was not to be heard out of doors. The filtering light cast a pall inside, a feeling of being in twilight even in the full light of day. Our Bard explained how the cairns were used as places for rites of passage for the young men, reciting in detail the historical story of one such venture that had been undertaken and laid into writing. Nether Largie is an impressive standing stone ‘circle’ on the south side of the village of Kilmartin. The large central upright stone, maybe twelve feet high, has cup and ring marks all about the north surface, indicating that this stone had previous ceremonial function before being raised, as cup and ring marks are always found on horizontal slabs. There are two sets of paired stones that stand to the northeast and to the southwest of the central stone. Astronomical surveying shows conclusively that these stones are aligned to mark the rising and setting of the full moon at the once-every-nineteen year lunar standstill extremes. This phenomenon was, indeed, the very reason that we had come to Scotland, to bear witness and to be activated by the influx of lunar polarity that surges forth at these precise moments of time. Just a bit further south stand the knoll of Dunaad, the place where the Irish, when they came to the land that was later to be named Scotland, established their base of operations. Here they built a fortress with walls ten feet thick, built of rock. This was an early form of ‘shock and awe’ tactics to impress the indigenous Pictish population. As with contemporary shock and awe tactics, it was wholly worthless in actually dissuading the locals from taking action to remove the invaders. From the landing of the Irish and the crowning of Fergus as king in AD 500 the Dal Riata kingdom reigned amidst warfare and struggle. In the year AD 849 Kenneth MacAlpine asserted himself as King, married a Pictish woman of royalty and declared that the wars were over, as they and the Picts were now one family. He then named the land Scotland, and the descendants of this co-mingling have been ever since known as the Scottish people. So here we were, sitting upon the top of Dunaad. Scot, the Bard, had just finished telling us of this history. I turned to Fiona and said “Fiona, did you get what Scot was just telling us about?” “Yeah, about that king dude or whatever,” she said. “And what was his name, Fi?” “I don’t know, it doesn’t really matter does it? I mean he was some king dude that stopped the wars.” “Well, Fi, it does kinda matter, cuz he is your Great-great-great-great and then some great grandfather!” “What?! You mean we’re related to him? Why didn’t you ever tell me before that we were Scottish?!! !” “Yes, Fiona, we are descended from the first King of Scotland. And I never mentioned it to you because I didn’t know myself until just a few days ago. Indigo’s mother-in-law did a genealogy for him before he came over with Mari to Scotland a few weeks ago. And he sent the genealogy chart but it didn’t arrive in the mail till after we left and so I asked Temu to open it up and tell me what it said. And he just told me a couple of days ago, so I figured this would be the place and time to fill you in.” Fiona got pretty silent, gazing off into… well, not space, but time… clearly looking at the implications of this new knowledge thrust into her young world. She wandered about, just sitting here and there, taking it all in. “So, Dad, you mean that our family used to live right here?” “Yep, right here on this hill he was born, raised and ruled.” “Wow,” she sighed, rather quietly, profoundly. We walked around a bit more up there. In one spot there is a rock with Ogham script (an ancient written language), a pictoglyph of a Boar, the animal of the Pictish clans. Also in this rock was a footprint about 3 inches deep. Scot had told us how a man who would be king, in those ancient times, vowed his loyalty to the land by marrying the Earth Herself. This was done by pressing flesh-to-flesh. In this case, Her flesh is the stone. The expectant king must place his foot in the graven recess. Only if his foot was received (that is, if it fit) by the Earth was he accepted by Her in marriage, and only then could he be crowned as king. After watching a few people place their foot in the hole, only to pull it out without their foot having fitted, did I then eye the footprint myself. 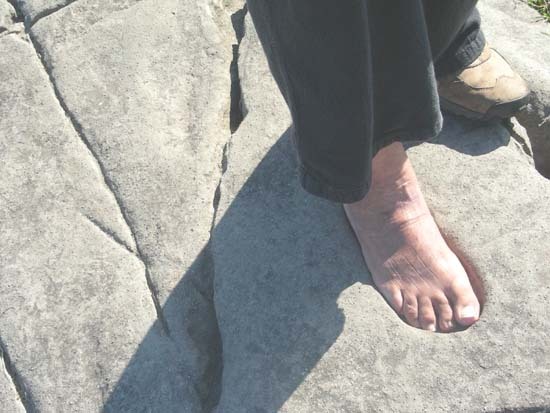 I took off my hiking boot and sock, placed my foot in the recess and… well, of course, it fit! I stood there in silence, pouring my prayers into the Earth who had received me, and reaffirmed my life long homage to Her. At one end of the valley (well, over the hill from it really) sits Ardfern. We had dinner in the Galley of Lorne Ardfern one evening. Scrumptious high-end Scottish cuisine was served, including a luscious rib eye steak of the famous Scottish Highlander breed of cattle. 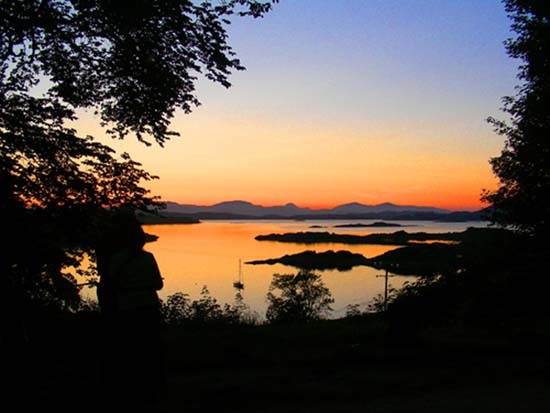 The marina of Ardfern overlooks the Straits of Jura that separates Scotland from Ireland. Ardfern is unique in that the Gulf Current touches upon the Scottish coast here, making the year-round weather unusually mild. There are even tropical plants that grow in the area! High above the shoreline sits the Castle of Lunga, a 16th century block and stone building that commands a view of the surrounding area. Gazing west from the bluffs at the Castle of Lunga provides a view unparalleled for its portrait perfect scenery: the marina with a few sailboats snugged in, the setting sun glistening off the water as the sky shimmers in iridescent ripples of purple, pink and mauve. To the south lies the Firth of Lorne. We could hear, in the distance, the rush and roar of the third most powerful natural whirlpool on the planet. This whirlpool, it is claimed, is the one made famous in the story of Jason and the Argonauts. Four days, July 13 – 16, we spent in Kilmartin Glen, visiting sacred sites, eating in fine restaurants and local pubs, being regaled with stories of yore by our Bard, walking through the museum and talking with the locals. A proud people these Kilmartin folks turned out to be, a people with a keen sense of their history. Over the years the government and university people had sent in grave robbers (disguised as archaeological teams) to steal items of significant historical value, which were then secreted away in Edinburgh and London. The local people knew, however, that these were not mere items of interest to be stored away for later viewing by a curious university team. They knew these items to be the living embodiment of powerful spiritual and ancestral forces, forces that rightfully belonged to the land and the peoples of Kilmartin Glen. So they organized themselves as the Kilmartin Trust and petitioned and demanded the return of the sacred icons of their people. Over the years, as they documented the origin of each piece, they won these artifacts back. 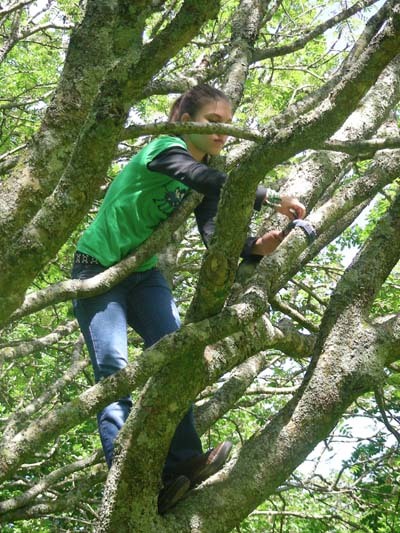 They are now held in trust, and for public viewing, by the Kilmartin Trust House and Museum. Leaving Kilmartin, knowing that we were headed for the cities of Edinburgh and Glasgow and then our return flights back to the States felt as if we were walking towards our own death. It hurt, it saddened; it was a rending of the Soul to leave Kilmartin Glen. To leave behind Callanish and Stornoway, the warm hearted people living each day in the blustery cold, Skye in its swaths of beauty, these were moments of life well lived, and difficult to walk away from. I cried. Fiona was morose, sad. I will return one day to the Outer Hebrides and to Kilmartin, to Dunaad, to our ancestral bones and homes. I will return home to the home of our ancestors.